But this is not the story of a life. again from grave after grave. From the start, the stories of Leo James Wright and Cordelia Davis Wright were never solely their own, but continuations of lives that began long before they were born. And how did I come to discover what happened to my grandparents in events preceding my birth? Where does such information come from? A curious child, I learned to listen between the lines when the Grans spoke, guessing at what they were trying to hide. I watched the way they looked at each other, held my breath during false starts and sudden silences. I waited patiently for bits of truth, sensing emotional codes hidden beneath the social ones, wondering what was beyond regret. I tried to imagine a family where it was safe to ask questions and to tell secrets of the heart, but that was not the world in which I grew up. Leo and Cordelia maintained order through silence. As a young adult I wished I could be part of a less frustrating family, one with fewer conflicts and hurts, maybe one that knew how to have fun. Over the decades I’ve come to realize that most of us cannot go out and form the kind of family we think is ideal. I have had to accept being part of a long chain of wary ancestors. No amount of wishful thinking can change that. Now that I am growing old, I have also grown more curious about genealogy and genetics, more interested in the forces of history, economics and DNA that shaped my forbears. I see this happening all over America, people my age getting interested in family history. You’ve got to start where you are, with the ancestors you’ve been given. So I asked the Grans for their stories. Leo and Cordelia obliged, offering their lives in bits and pieces, hints and glances. Silent in life, the Grans now rest in eternal stillness, but in these pages they do not stay dead. As far as Ancestry.com is concerned, the lives of Leo and Cordelia Wright are a closed book, but I brought them back from the grave by “hearing them into speech” and composing their stories from a combination of intuition and imagination. Family memoir, like fiction, requires the reader to act as if things really happened this way and each act of reading SILENT VOICES brings Leo and Cordelia Wright back to life. Essayist James Wood terms it “an allowable resurrection” in his New Yorker reflection titled “WHY?” He insists that it’s never too late to listen for untold family stories and to put them on record even if the writer wasn’t there when they happened. I would add that it’s never too late for compassion, either. If a grandchild can offer any gift to her ancestors, let it be an allowable resurrection. “Silent voices” is a fresh idea, a truth-filled story (almost a long parable) inviting us to really listen to our own families. Judith Wright Favor made the characters real and the times familiar, reawakening details of food, décor and events with my own grandparents. Not only did I enjoy accompanying her grandparents through their lives, I made mental notes of what I might say if ever I set out on the same journey. In the family tree, the seven sections, the reminder that the sheriff is fictional, the influence of dogs and birds, this book modeled a way to write about my own grandparents. I enjoyed Silent Voices because I can envision the people while reading it. I love that about Judith’s writing. I was glad to know more of the story about how her great grandmother ended up in the poor house, the difficult decision her grandfather had to make, how he and her grandmother had to live with that decision, and how it affected their lives. I really look forward to reading more books by this author. 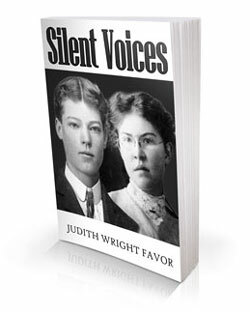 Reading Silent Voices brought to mind my patrician paternal grandparents behind their polished masks, and my maternal grandmother deserted by her philandering husband and left penniless with four young daughters. Here Judith Wright Favor has dared to inhabit her own grandparents and those with whom their lives intersected, vividly describing and giving voice to the loves and losses that impacted their lives. Silent Voices is part memoir, part meditation and part masterful story; I think the author has invented a new genre! I was drawn into this story from the beginning. Having previously read The Edgefielders, the thread that kept drawing me along in Silent Voices was the author’s unspoken hope for her grandparents. Near the end Cordelia asks herself “How long does hope live?” then responds “For an eternity.” The Wrights remind me of my grandparents and leads me to reflect on what may be hidden in the crevices of my own family story. Do you think about your relatives and wonder what experiences shaped them and contributed to their particular personality characteristics? 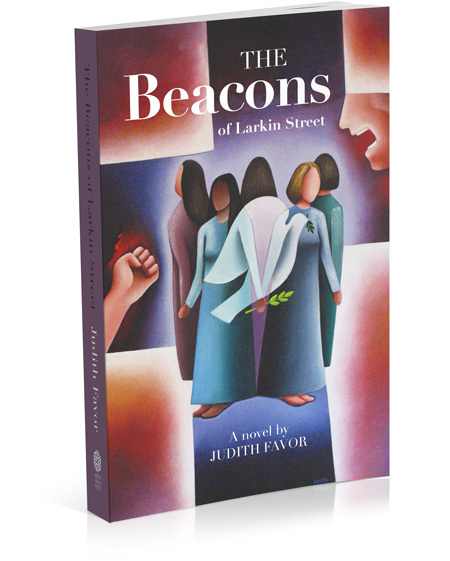 In this engaging story Judith Wright Favor has found a way to understand and develop compassion for her kin. Drawing upon memory, imagination and intuition she gives Leo and Cordelia Wright new life through poignant vignettes in this highly readable memoir. 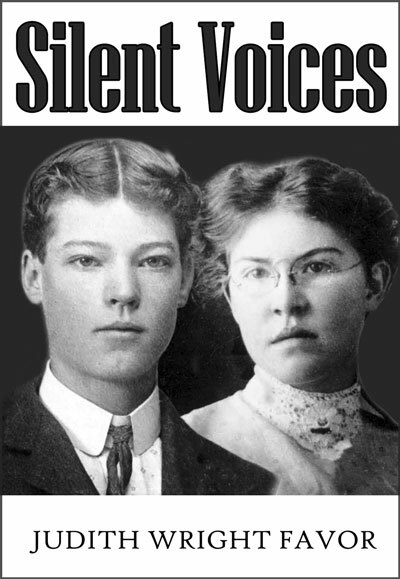 Silent Voices gives a glimpse of the lives of a man and a woman, from their difficult early days, to their coming together in the bloom of young adulthood, to raising their family. The reader is linked to Leo and Cordelia amidst the story of our nation, Depression, WWII and Hiroshima. It is a captivating read. I saw this as a story of redemption, was very caught up in it and read the book in one sitting. I appreciated the author’s desire to speak to the silences and secrets of our lives. Silent Voices is imbued with the person Judith has become, including her spirituality and her understanding of what people do to make meaning from difficult circumstances.